Darwin has been nearly destroyed four times. There were the Japanese bombings of World War II and three powerful cyclones in the past century, most recently Cyclone Tracy on Christmas Eve 1974. The city of 140,000 in Australia’s remote Northern Territory knows how to rebuild. There’s construction everywhere and modern skyscrapers shaping the city’s expanding skyline. 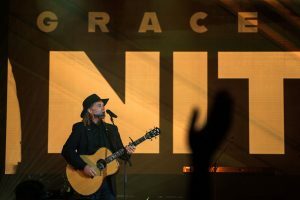 Australian country gospel singer Steve Grace has visited Darwin many times, and on Wednesday took part in Franklin Graham’s evangelistic event there. >> Franklin Graham will visit four more Australian cities this month. See where the Graham Tour is headed next. “My prayer for the people of Darwin is that they, too, like their city, can be reborn,” Grace said, wearing a black baseball hat with the word “Eternity” written across the front. 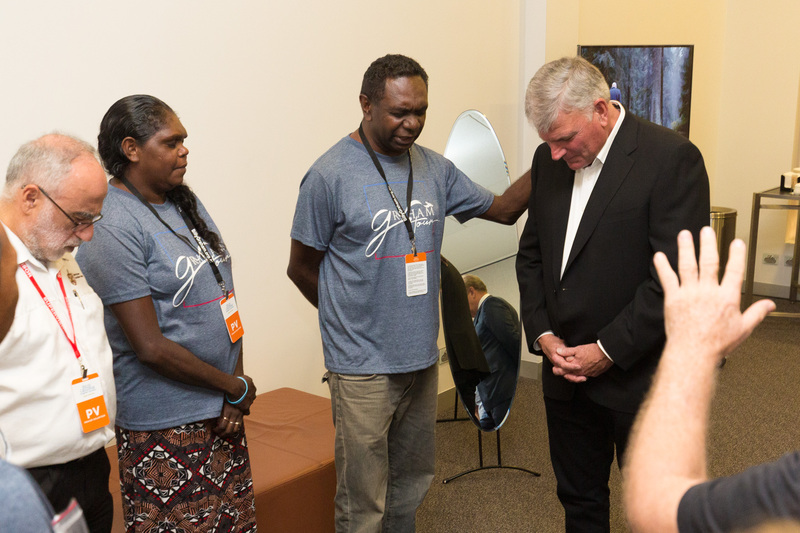 Franklin Graham visited Darwin, Australia’s most remote capital city, for the first time on his second stop of the six-city Graham Tour. Darwin has one of largest Aboriginal populations in Australia. Pastor Bunumbirr Marika (center) spent three weeks traveling around the Northern Territory to tell Aboriginal people about the tour. The people in this area are proud to be “Top Enders,” he said, able to survive the oppressive heat of pre-monsoon season and some dangerous wildlife, like the lethal box jellyfish. “This is the land of crocodiles and wild water buffalo and snakes and all kinds of things that can kill you,” Grace said. But sometimes that tough-as-nails mentality can get in the way of a person’s need for God, he added. Franklin Graham looked deep into the 3,100-plus crowd Wednesday night, recognizing that many may be burying their problems, seeking escape in anything that can take their mind off them. “Have you ever thought about what it would be like to run and get as far away from home as possible?” Franklin asked before sharing a Bible story from Luke 15. The story was about a young man who left his family for a seemingly better life he soon found out wasn’t so great. Longing for his father’s home, he returned, greeted with open arms. “Have you been running? It’s time to stop. It’s time to come home,” Franklin said. At 4 a.m. on the day of the event, Bunumbirr Marika woke up with a vision from God. 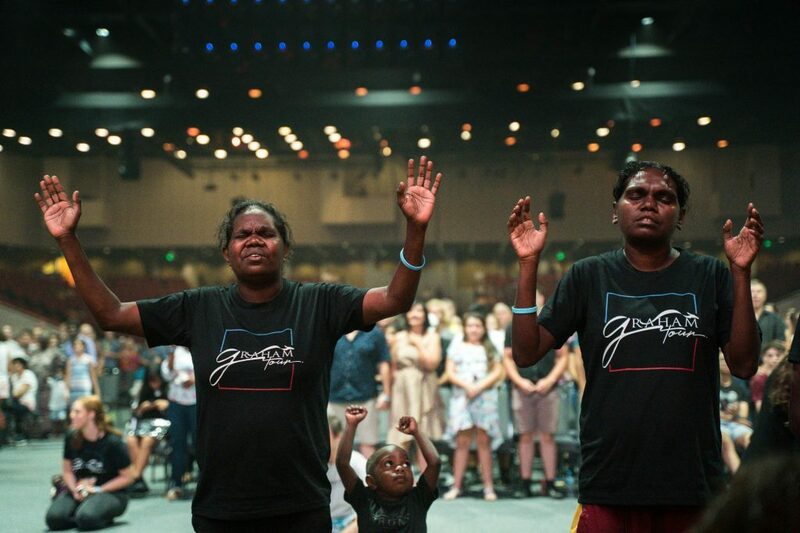 The Aboriginal pastor who helped spread the word about the Graham Tour said he saw a deep, clear river. Marika lives in the northern town of Yirrkala, a day’s drive from Darwin. For 30 years, Steve Grace has traveled around Australia doing what he calls “music evangelism,” building relationships with people in some of the country’s most secluded places and telling them about Jesus. Months ago, he had a different vision—one of a bald eagle, the United States’ national bird. A week later, he met an American named Justin Hoover who helped manage the Graham Tour stop in Darwin, a meeting that ultimately led Marika to spend three weeks traveling across the Northern Territory, sharing the Gospel and inviting people to hear more about Christ from American evangelist Franklin Graham. “Indigenous people are very open to the Gospel because of the missionaries,” Marika said. Steve Grace has been in ministry over 30 years, building relationships with people in some of the most isolated places of Australia. He said Aboriginals identify with the abandonment, rejection and suffering Jesus went through. In their culture, retaliation has to take place when someone does something bad to you, Grace said, but with Christ, “that battle is over.” His perfect blood was spilled, covering all sins. When Franklin invited the crowd to make Jesus part of their lives, more than 300 made their way forward—a man with one leg, a blind man holding onto the shoulder of a friend, a woman wearing a neck brace and children coming barefoot. Some waited patiently to talk to a prayer volunteer as Billy Graham Evangelistic Association (BGEA) chaplains filled in to accommodate the crowd. Prayer volunteer Joy Onyeledo spoke with a woman who was moved by the message and decided to follow Christ. Fellow volunteer Edwin Casilla talked to another who traveled hours from the middle of Australia to see Franklin Graham preach and said she watches Billy Graham’s sermons on YouTube. Rev. Marjorie Hall, who traveled from eight hours away with four dozen others, joined her daughters in praying for both physical and spiritual healing over their community, specifically for the men to start filling the churches that mostly women attend. In the 1950s, Steve Grace’s parents saw Billy Graham preach, one factor in their decision to attend Bible school. Grace has shown the 1960 BGEA film “Shadow of the Boomerang”—featuring Aboriginal Gospel singer Jimmy Little—at some of his music events, seeing many begin a relationship with Christ and get baptized as a result. And Wednesday, he saw another work of God. Please pray for each one moved by the Gospel on Wednesday and for local churches as they follow up with new believers. The Graham Tour continues through Feb. 24. Learn more.